MOLST is a communication process designed to improve the quality of care seriously ill patients with advanced medical conditions receive at the end of life. Completion of the MOLST is voluntary. The MOLST form is a portable medical order form that must be honored by emergency medical personnel in an emergency and all health care professionals in all settings. MOLST orders are completed at the end of a thorough conversation or series of conversations between the patient (or the Health Care Agent or Surrogate if the patient is unable to make complex MOLST decisions) and their physician or nurse practitioner. Conversations may include other medical team members, within scope of practice. A thoughtful MOLST discussion must focus on the patient’s current health status, prognosis, goals and preferences for treatment, and most especially, what matters most to the patient. Ideally, the health care agent(s) and family should be present for the MOLST discussion; family members and caregivers need to be aware of the patient’s MOLST decisions and what MOLST means. After the conversation is complete, MOLST orders are documented on a New York State Department of Health MOLST form and signed by a physician or nurse practitioner. MOLST can also be completed in eMOLST. In this section, learn more about the conversation elements using the nationally-recognized 8-Step MOLST Protocol, including the ethical and legal requirements for making MOLST decisions in the other pages in this section. Public health law governs withholding/withdrawing life-sustaining treatment. The physician or nurse practitioner must complete all legal requirements before signing MOLST orders. Be prepared for the discussion and read more about the MOLST form, what to do when it is completed and the care plan needed to support your treatment preferences expressed on the MOLST. Before you consider a MOLST, it is important to know how it differs from an advance directive and whether MOLST is right for you. Standard medical care means a patient receives all necessary medical treatment, unless there is a medical order to withhold treatment. Advance directives (like a health care proxy and living will) document future care preference and are difficult to interpret in an emergency. Advance directives are for everyone 18 years of age and older. 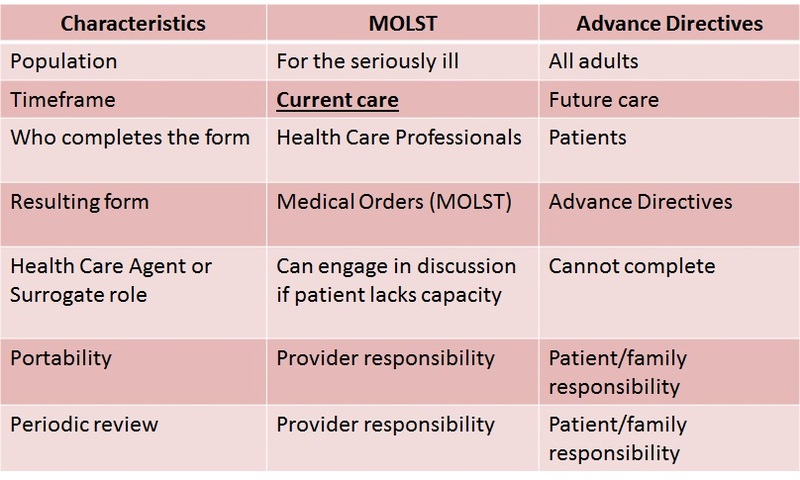 MOLST is a set of medical orders that defines life-sustaining treatment the patient wants to receive or avoid now. Once MOLST is properly completed and signed by a physician or nurse practitioner, MOLST must be honored by all health care professionals in all settings. Patients who are appropriate for MOLST should have an up-to-date health care proxy in case MOLST orders need to be revised after the patient loses capacity. MOLST is not an Advance Directive. Learn more about the differences between MOLST and advance directives here. Healthy people are NOT appropriate for MOLST and should complete an advance directive and have a discussion with family and loved ones. Likewise, people who have a chronic condition or multiple chronic conditions but have a long life expectancy are not appropriate for MOLST. People who are receiving post-acute care in a skilled nursing facility may or may not be appropriate for MOLST. They should be screened to see if they fit any of the categories of people who should consider MOLST. Frailty is a common clinical syndrome in older adults that carries an increased risk for poor health outcomes including falls, disability, hospitalization, and mortality. It results from aging-associated decline in reserve and function across multiple physiologic systems such that the ability to cope with every day or acute stressors is comprised. A frail individual has a weak grip, low energy, low physical activity, walks slowly, and may have unintentional weight loss. Advanced chronic conditions coupled with frailty are people at highest risk for recurrent hospitalizations, worsening frailty, diminished functional status in everyday life and ultimately, mortality. These individuals deserve to be offered the opportunity to learn about and complete a MOLST. MOLST orders must always be based on the person’s current health status, current prognosis, and their goals for care today. MOLST orders must be reviewed and renewed periodically by a physician or nurse practitioner. When a patient moves from one care setting to another, their health status and prognosis may change. Thus, it is important for the physician or nurse practitioner to review and update the MOLST at the time of care transition. MOLST orders can change over time as the person’s condition changes and in line with the person’s goals and preferences. Learn more about how MOLST must be reviewed and renewed and how orders can change over time in the section on Review & Renew.